The Pink Palace Museum is one of the largest museums of its kind in the southeastern United States. Its large collection of permanent exhibits help visitors to explore Memphis' natural and cultural history, while its vast variety of touring exhibits give guests an intriguing and well-rounded visit. The Pink Palace Mansion is exactly that -- a mansion built of pink Georgian marble. It was designed in the early 1920s to be the home of Clarence Saunders, a prominent Memphian and founder of Piggly Wiggly stores. Before the mansion's construction was complete, Saunders was forced to file for bankruptcy. In the late 1920s the home was given to the city of Memphis to be used as a museum. Mansion exhibits include: Memphis Music, The Changing Roles of Women, Cotton Carnival, and Memphis Memories. Adjacent to the mansion is the more modern Pink Palace Museum building. This building also houses many of the museum's permanent exhibits. These exhibits include: a walk-through replica of the first Piggly Wiggly store, the amazing Clyde Parke Circus which is a mechanical one inch to one foot scale model circus, Native American pottery, and fossils. This building hosts ever changing traveling exhibits, as well. The Memphis Pink Palace has a CTI 3D Giant Theater, which uses RealD 3D digital technology and a state-of-the-art sound system. The Giant Theater seats 240 people and shows a variety of educational 3D films, such as Extreme Weather, National Parks, and Walking With Dinosaurs. In addition, the Pink Palace screens classic family films in 2D on occasion - everything from The Muppet Movie to Harry Potter to animated Disney classics. The Sharpe Planetarium, also located inside the Pink Palace Museum, has a variety of shows about stargazing, astronomy, outer space, and more. Currently, the Sharpe Planetarium is open Tuesday through Saturday. Click here for a current schedule of planetarium shows. Sunday, 12:00 noon - 5:00 p.m.
Children ages 2 and under get in free to exhibits and activities. *Hours and admission fees subject to change. It is recommended that you contact the museum to verify this information before your visit. 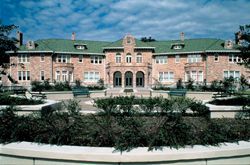 There are several other facilities that are a part of the Pink Palace Family of Museums. Click on each link below to learn more about them.